The Official Monster Raving Loony Party is a political party established in the United Kingdom in 1983 by the musician David Sutch, better known as "Screaming Lord Sutch, 3rd Earl of Harrow" or simply "Lord Sutch". It is notable for its deliberately bizarre policies and it effectively exists to satirise British politics, and to offer itself as an alternative for protest voters, especially in constituencies where the party holding the safe seat is unlikely to lose it. Starting in 1963, David Sutch, head of the rock group Screaming Lord Sutch and the Savages, stood in British parliamentary elections under a range of party names, initially as the National Teenage Party candidate. At that time the minimum voting age was 21. The party's name was intended to highlight what Sutch and others viewed as hypocrisy, since teenagers were unable to vote because of their supposed immaturity while the adults running the country were involved in scandals such as the Profumo Affair. After being shot during a mugging attempt whilst living in the United States, Sutch returned to Britain and to politics during the 1980s. The "Raving Loony" name first appeared at the Bermondsey by-election of 1983. A similar concept had appeared earlier in the "Election Night Special" sketch on Monty Python's Flying Circus, in which the Silly and Sensible parties competed, and a similar skit by The Goodies, in which Graeme Garden stood as a "Science Loony". There had also been a "Science Fiction Looney" candidate competing in the 1976 Cambridge by-election. Two others were important in the formation of the OMRLP. John Desmond Dougrez-Lewis stood in the Crosby by-election of 1981 (won by the Social Democratic Party's co-founder Shirley Williams). Dougrez-Lewis stood in the by-election as "Tarquin Fin-tim-lin-bin-whin-bim-lim-bus-stop-F'tang-F'tang-Olé-Biscuitbarrel", taken from the Election Night Special Monty Python sketch. He had changed his name by deed poll from John Desmond Lewis, on behalf of the Cambridge University Raving Loony Society (CURLS). CURLS were an "anti-political party" and charity fundraising group formed largely as a fun counter-response to increasingly polarised student politics in Cambridge, and they were responsible for a number of fun stunts. Their Oxford University equivalents were the "Oxford Raving Lunatics". Dougrez-Lewis became Sutch's agent at the notorious Bermondsey by-election mentioned above, where the OMRLP banner was first officially unfurled. Reverting to his original name, Dougrez-Lewis stood for the new party in Cambridge in the 1983 general election. Another serial offbeat by-election candidate was Commander Bill Boaks, a retired World War II hero who took part in sinking the Bismarck. Boaks campaigned and stood for election for over thirty years on limited funds, always on the issue of road safety. Boaks proved influential on Sutch's direction as the leading anti-politician: "It's the ones who don't vote you really want, because they're the ones who think". Boaks thought that increased traffic and more roads would cause problems, and he addressed road safety with flamboyant campaigning and a variety of tactics, including private prosecution of public figures who escaped public prosecution for drunk driving. He successfully campaigned with Sutch and others to pedestrianise London's Carnaby Street. While recovering from being struck by a motorcycle, Boaks was one of Sutch's counting agents at Bermondsey in 1983. A plan for him to run as an Official Monster Raving Loony Party candidate in the 1983 general election, in Sutch's and Boaks's own home constituency of Streatham, was mooted at Bermondsey, but this never happened, probably because of his increasing infirmity. By the time his predictions of unnecessary child deaths, pollution and traffic congestion proved correct, Boaks was dead, having succumbed to head injuries suffered on exiting a bus. Screaming Lord Sutch committed suicide on 16 June 1999 while suffering from clinical depression after his mother, Annie, died in 1998. Sutch's funeral – organised by his lifetime friend, the session drummer Carlo Little – was attended by members of the OMRLP and RLGGP, including Hughes, who with Freddie Zapp brought along a huge floral tribute shaped as an OMRLP rosette; they provided a more dignified entourage than Sutch's own relatives and romantic partners, who fought with one another at the graveside. The running of the OMRLP fell to Alan "Howling Laud" Hope and his late cat, Catmando (killed 2002), who were the joint winners of the 1999 membership ballot for the replacement for Sutch. The OMRLP fielded 15 candidates in the 2001 general election, at which they had their best general election results to date. A biography of Sutch, The Man Who Was Screaming Lord Sutch (by Graham Sharpe, the Media Relations Manager for bookmakers William Hill), was published in April 2005, describing what remained of the party as "wannabes, never-would-bes and some bloody-well-shouldn't-bes". The manifesto, entitled "The Manicfesto", for the 2005 general election featured the major commitment of their long held pledge to abolish income tax, citing as always that it was only meant to be a temporary measure during the Napoleonic Wars. This has been a Loony staple policy since the original manifesto was written by Sutch's agent Pauline Read in 1983. Also included was another old staple, the "Putting Parliament on Wheels" idea of having Parliament sit throughout the country rather than solely in London—with special emphasis this time in its creation negating the need for national/regional assemblies. Overall the results were a disappointment for the OMRLP after their success in the previous general election showed there was life after Sutch; the only improvement was Alan Hope's increase of the vote to over 500, but all other candidates saw marked reductions—including Owen, contesting the Wokingham seat for the first time, haemorrhaging over 300 votes to the BNP. "Top Cat" Owen is the only member of the current OMRLP line up ever to poll over 1,000 votes (he polled 2,859 votes in the 1994 European elections), and his dip in fortunes despite a previously strong local following appears to have killed the last realistic chance the party ever had of seeing a saved deposit. The party also suffered from an ill-needed row over its York branch, which led to there being no "official" City of York candidate and gave more credence to those that denounced the post-Sutch OMRLP as little more than a PR machine for pub-circuit entertainers rather than a political party. Graham Cambridge, otherwise known as Eddie Vee, the Elvis-impersonating previous candidate, wished to stand again, but the branch honorary secretary John Morris and the branch treasurer, Gareth Sheehan (also known as "Spydaz") elected to have the famous alternative artist Andy "Milladdio" Hinkles as the candidate and asked Vee to stand elsewhere. Spydaz was known as York's "super-squatter", an activist of the York Peace Collective that led a series of highly publicised squats during 2003 and 2004 to highlight neglected "listed" buildings (including the holding of art exhibitions). The response however from OMRLP headquarters was for Deputy Leader Boney Maroney to promptly expel Morris and Spydaz from the party. In York's "Evening Press" newspaper of 12 April 2005, Maroney claimed it was "for selling loony merchandise against Electoral Commission rules": to be precise the OMRLP's Financial Scheme as registered with the Electoral Commission, which meant any Branch of the OMRLP taking money on the party's behalf would be breaching the Political Parties, Elections and Referendums Act 2000 Part 2. As such, the York Branch's alleged selling of merchandise provided a pretext to expel the entire branch—bar Vee—and declare Vee to be the "approved" York candidate. Vee then failed to raise the £500 deposit to stand, but the expelled York Branch members had the deposit for Hinkles—now standing as a York Integrity Party (although the ballot paper simply reads "Independent Hinkles")—submitted within days of the Notice of Election being posted. Morris, Hinkles and Spydaz offered an olive branch to party HQ, but with no response, and with the Socialist Alliance and the Green Party contesting the seat, any hopes the Hinkles candidature may have had of attracting the "alternative" vote from his association with Spydaz were dashed—he barely took 100 votes. There were however two crumbs of comfort. For the third election in a row, the OMRLP found its candidates being debarred from the Hansard Society/BBC TV "Newsround" School Mock Elections running in tandem with the general election (the same fate befell the BNP), and the party advised pupils to get voters to spoil their ballot papers in protest or simply write "OMRLP" on the ballot papers in schools that refused to back down. In the event, 102 Raving Loony school candidates stood, winning in 21 of these, and taking enough votes in two parliamentary constituencies to be declared to have 'won' the seat—the two being Bristol East (the former seat of Tony Benn) and the hard-line Tory constituency of Chesham & Amersham, neither of which have any history of active Raving Loonyism before. The OMRLP's official headquarters was originally the (now gone) "Golden Lion Hotel" in Ashburton, Devon, then the "Dog & Partridge" pub at Yateley in Hampshire, but this was lost shortly after the 2005 general election. Conference venues are now chosen in advance: the 2006 conference was held at Torrington in Devon, and the 2007 conference was held in Jersey. Although Alan Hope took over as Party Leader after Sutch's death, the real day-to-day running of the party has always been done by other party members. Even on the council election circuit, its vote, funds—and public interest—appear to be in terminal decline, facing a tighter squeeze for the "protest vote" from other minor UK parties with more members, money, and organisation. The party fell foul over its funding on 26 September 2005 when the Electoral Commission required them to return a donation of £350 sent by a supporter from the Crown Dependency of the Isle of Man. The party's last elected representative was R. U. Seerius (formerly Jon Brewer) on the 11 member Sawley Parish Council in South Derbyshire, first elected (uncontested) in 2005. He was no longer a member as of May 2007, having failed to appear in no less than 11 statutory meetings during his time in office, due to illness. The party contested both the Bromley and Chislehurst and the Blaenau Gwent Parliamentary by-elections on 29 June 2006; and with it a degree of their previous by-election lustre—a matter perhaps the result of the return of Willi Beckett to frontline OMRLP activities; tragically in October 2006 he was diagnosed as terminally ill with cancer, and he died on Friday 2 March 2007, less than a day after setting up his own MySpace website. His ashes were later used to make his farewell vinyl single. In March 2007, Melodie "Boney Maroney" Staniforth, the Deputy Leader resigned from the party, though she stood in the April 2007 Kirklees council elections as an OMRLP candidate. The party's webmaster, Stuart "Parish Poisoner" Estell did likewise. According to her 29 March 2007 interview with the "Huddersfield Examiner" newspaper, she was doing the party's books, merchandising & electoral law work with little help, and had grown fed up with the lack of leadership accountability. Asking Hope to become Party President whilst she would become official Party Leader, Hope refused, saying he was leader until death. Ironically, she had been the most vociferous critic of the Raving Loony Green Giant and Rock'n'Roll Loony factions that had left the OMRLP for largely the same reasons, and of John Tempest's more organised approach to elections and funding. She has since stood as a candidate for the Blah! Party. Hope retaliated with a press release stating that "although the sudden resignation of a main party member was a shock the Loony party is not just one person and will continue regardless." and that "the party will never again be reliant on one person". The post-Staniforth OMRLP succeeded in standing in the two by-elections of 19 July 2007 in Sedgefield and Ealing Southall, but again achieving derisory results: Alan Hope acquiring 129 votes (0.46%) and John Cartwright taking 188 (0.51%), beating the English Democrats but coming behind the Christian Party of the Reverend George Hargreaves and David Braid. In recognition that reforms were needed, Peter 'T.C.' Owen was moved from the honorary position of Party chairman to that of Deputy Leader (& thus effective day-to-day leader) of the OMRLP, whilst Anthony "The Jersey Flyer" Blyth (owner of the Ommaroo and a member of the Jersey Heritage Trust) took over Owen's role. A self-styled pragmatist, Owen comes from the side of the OMRLP that always took the fighting of elections seriously and is one of four Raving Loonies to have scored over 1000 votes in an election. Nick "The Flying Brick" Delves was the candidate at the Crewe and Nantwich by-election, 2008 on 22 May 2008. He is the party's current treasurer and has contested several general elections and council elections for the OMRLP. Delves finished 7th out of 10 candidates with 236 votes (0.57%), coming behind the Green Party of England and Wales, United Kingdom Independence Party (who stood MEP Mike Nattrass as their candidate) and even the English Democrats. At the announcement of the result, the candidates were made to stand with the returning officer on the right side of the stage, whilst their agents stood some distance away on the left. However, chairman Alan Hope and Nick Delves swapped places so that Hope would be televised being the first to shake the victorious Conservative candidate's hand. On 31 May 2017 Hope was interviewed by Andrew Neil on the BBC's Daily Politics programme. In 1987, the OMRLP won its first seat on Ashburton Town Council in Devon, as Alan "Howling Laud" Hope was elected unopposed. He subsequently became Deputy Mayor and later Mayor of Ashburton in 1998 (mainly opposed by the local Conservatives; they never forgave him for becoming a member of the OMRLP) until he moved to Hampshire after Sutch's death. For over a decade, his hotel "The Golden Lion" in Ashburton (referred to by some in the party as "The Mucky Mog") was the party's headquarters and conference centre. The first Raving Loony to win a vote, rather than an uncontested election, was Stuart Hughes, taking the "safe" Conservative Party seat of Sidmouth Woolbrook on East Devon District Council in May 1991. He also took a seat on Sidmouth Town Council from the Conservatives the following day. His success was met with hostility from the local Tories. Hughes' reaction was to attempt to make their lives a misery for the next three years by refusing to pay his Community Charge (popularly known as the Poll Tax), then dumping scrap metal in the middle of the council chambers to the value of his unpaid tax when threatened with legal action. He also formed an alliance known as "The Coastals" (because of the seats they held) of Independents and the sole Green Party councillor, giving East Devon's ruling Conservatives the first true opposition they had faced for decades (the local Liberal Democrat and Labour parties being negligible). Hughes retained his seats with increased majorities in subsequent elections, and the final humiliation for the Conservatives came when he took the Devon County Council seat from the local party's Chief Whip in the council. Hughes remains a member of all three councils to this day[when? ], although he now does his politicking, ironically, as a Conservative. To date, two councillors have subsequently become mayors: Alan Hope in Ashburton, Devon and Chris "Screwy" Driver on the Isle of Sheppey in Kent. At the Bootle by-election in May 1990, the Loony candidate (Sutch) received more votes than the candidate for the continuing Social Democrats. The OMRLP newsletter for June 1990 released by Alan Hope said "What is going on?" and Sutch himself appeared utterly shocked when interviewed by the BBC after the result was announced. The story was a major headline in many UK newspapers; ironically, the by-election itself had attracted little coverage. The little media attention there was focused on a bizarre row between Labour and the Raving Loonies. Relations between Labour members and Raving Loonies had never been good, but they reached a new low when the Labour agent tried to have Sutch arrested for breaking an old electoral law forbidding the use of a public house as an election campaign headquarters. This law had been repealed in 1987. The tabloid newspapers then referred to "Kinnock's Killjoys" for the remainder of the campaign's duration. The result was the last straw for the continuing Social Democrats (centred around former Labour Foreign Secretary and Social Democratic leader David Owen) who had refused to accept the merger of the SDP with the Liberals to form the Liberal Democrats. Rubbing salt in their wounds, Sutch offered in jest to form a coalition with them, but they instead disbanded, though in a repeat of the events of 1988 once again a week later some members voted to carry on. Almost a year after Bootle, the supposedly dead SDP finished fourth at Neath, beating the OMRLP to fifth place (see the continuing Social Democratic Party). Although there have been far more prestigious Loony results before and after (particularly Monmouth), Bootle is still regarded by Raving Loonies as their finest hour, the watershed moment when they had to be treated as a serious political party, albeit one largely lampooning the political world. Sutch also defeated a joint Plaid Cymru/Green Party candidate at the bitter Monmouth 1991 by-election and almost beat the ruling Conservative Party's candidate at the Islwyn 1995 by-election later on—but by this time the OMRLP were organised enough to make coming in fourth the norm in by-elections in England and Wales. John Tempest (a former Liberal/Liberal Democrat press officer and election agent and co-founder of the Bradford Soup Run charity for the homeless) and his friend and OMRLP activist Willi Beckett (one of the founders of the anarchist One-In-Twelve Club in Bradford) transformed the way the party fought elections. From the outset they were determined to make the OMRLP reap the rewards of being the unofficial "protest vote party" of the UK: posters, car stickers, and a never-ending series of headline-grabbing stunts made it easier for the party to gain publicity, and ensured they were treated fairly by the media. Three by-election TV shows were cancelled when the OMRLP used the law to stop them having candidate debates that barred the Loony candidate. Knowing Me Knowing You with Alan Partridge seemed to parody what might have happened had these shows gone ahead. The party attracted some corporate sponsorship from the makers of "Monster Munch" crisps and "Spillers" dogfood, albeit to lampoon the manner in which Labour Party under Tony Blair in particular had become big business puppets. Tempest and Beckett suffered the same problems from the "Fun-da-Mental-ist" faction, but by then new people had entered the party. Future chairman Peter 'T.C.' Owen believed that beating the other parties was what it was all about, and saw nothing funny about coming last with a handful of votes. Also Tempest was known as one not to suffer fools gladly (there were a number of clashes between him and Hope). The party has a number of parish councillors spread across several parishes. For the 2010 general election, the OMRLP used the description Monster Raving Loony William Hill Party, which was met with criticism by some members, with John Cartwright, Loony candidate in Croydon, publicly stating, "I am not and will not be a mercenary, or an advert, for a commercial company during the course of the election campaign." Just like any other party, the OMRLP has long suffered from splits over policy; here, the policy differences are regarding just how silly it should be. Many believed that the splits were flimsy attempts at poking fun at the series of splits going on in British politics during the late 1980s—at the Vauxhall by-election there were two Green candidates, a candidate from the Green Party but also another candidate from an organisation calling themselves "The Greens" and two National Front candidates from their warring "Third Way" and "Flag" factions, whilst at the same time feuding continued between the Social and Liberal Democrats and Social Democratic Party candidates, both products of a merger—but the splits were serious, despite Peter "Top Cat" Owen's blithe dismissal to journalists that "the only splits I'm interested in are the ones with bananas in them" (which led to his adoption of an inflatable banana when on the campaign trail. Owen's election leaflets are also noted for stressing his political philosophy as a "pragmatist"). Some members believe that OMRLP activities are purely for fun (and an ego trip or publicity for their entertainment business), while others see the party in the same vein as Private Eye magazine or programmes such as That Was The Week That Was or Spitting Image, using satire to make serious points on issues of the day. Tensions have often resulted because the more serious types in the OMRLP have managed to do what most observers considered impossible—actually achieve a creditable number of votes—tending to put the noses of the "Fun-Da-Mental-ists" out of joint. There were also objections in some quarters to the continued presence of alleged brothel keeper and minor celebrity Cynthia Payne—a friend of Sutch—who was at the front of many party photo opportunities, but continued to stand instead as a member of the rival Rainbow Alliance party (aka Captain Rainbow's Universal Abolish Parliament Party) of George Weiss (a friend of Ian Dury and Peter Cook). The controversy heightened after Weiss was convicted of heroin possession (the News of the World settled a damages claim by the OMRLP, for saying Weiss was a member, out of court). Owing to ill health, Lord Sutch became less involved with the party and his last campaign was in Winchester after a by-election was called when the main election was undecided due to a count difference of just two votes between the Conservative and Liberal Democrat candidates. Assisted by his Campaign Manager and Election Agent, Peter 'Uncle Belly' Byford, the party gained 316 votes. In 1989, Stuart Hughes, along with Danny Bamford (later Danny Blue), Roly Gillard, Melvyn Hartshorne, inventor Mike Madden, and tree surgeon Stuart Greenwood formed the breakaway Raving Loony Green Giant Party (RLGGP), mainly due to personality clashes with OMRLP chairman Alan Hope and other "Fun-da-Mental-ists"—the final straw being the latter (and Sutch's) behaviour during a sponsored walk to the Scilly Isles for the children's cancer charity, CLIC (now merged into CLIC Sargent), where they only turned up at the start and finish for the media call whilst Hughes and others did the whole event. The 2001 election was followed by a series of disastrous by-election results and a further split. Town Councillor Chris Driver formed the Rock 'n' Roll Loony Party with Mad Mike Young and others dissatisfied with Alan Hope's leadership, in a sad replay of the events surrounding the OMRLP/RLGGP split a decade earlier (Roly Gillard, who had rejoined the OMRLP upon the RLGGP's demise, also took part in this split). This splinter however did not last anywhere near as long as the RLGGP, although in a replay of what happened to Stuart Hughes and the RLGGP, success at the ballot box ensured the failure of the new party. Chris Driver's election as Mayor of Queenborough Town Council for the municipal year 2002/2003 curtailed on its leader's time enough to ensure party activities effectively ground to a halt. By 2004, the RRLP was effectively dead, with most of its members having rejoined the OMRLP. (Gillard however dropped out of politics altogether in 2002 after his wife's suicide). The statement of accounts for the period 1 January to 31 December 2008 outlines membership at 1,354, made of 173 paying members and 1,181 "lifetime but non-paying". It currently costs £9.99 per year for membership, although a £19.99 membership with included T-shirt is also offered. Sir Patrick Moore (1923–2012), the British TV amateur astronomer, was the finance minister of the party for a short time. He once said that the Monster Raving Loony Party "had an advantage over all the other parties, in that they knew they were loonies." In 1992, the Glasgow band Hugh Reed and the Velvet Underpants released the song "Vote Monster Raving Looney", despite not having any actual ties to the party. The OMRLP are distinguished by having a deliberately bizarre manifesto, which contains things that seem to be impossible or too absurd to implement – usually to highlight what they see as real-life absurdities. Despite its satirical nature, some of the things that have featured in Loony manifestos have become law, such as being able to vote at 18, "passports for pets", abolition of dog licences and all-day pub openings. Other suggestions so far unadopted included minting a 99p coin and forbidding greyhound racing in order to “stop the country going to the dogs”. The Loonies generally field as many candidates as possible in United Kingdom general elections, some (but by no means all) standing under ridiculous names they have adopted via deed poll. Sutch himself stood against all three main party leaders (John Major, Neil Kinnock and Paddy Ashdown) in the 1992 general election. Parliamentary candidates have to pay their own deposit (which currently stands at £500) and cover all of their expenses. No OMRLP candidate has managed to get the required 5% of the popular vote needed to retain their deposit, but this does not stop people standing. Sutch came closest with 4.1% and over a thousand votes at the Rotherham by-election, whilst Stuart Hughes still holds the record for the largest number of votes for a Loony candidate at a Parliamentary election, with 1,442 at the 1992 general election in the Honiton seat in east Devon. The all-time highest vote achieved was by comedian Danny Bamford aka Danny Blue, who secured 3,339 votes in the 1994 European Elections under the pseudonym of "John Major". Bamford had also acted as an election agent for Lindi St Clair's rival Corrective Party, and was a former close associate of Stuart Hughes. In the run-up to the 2011 Alternative Vote referendum, the party adopted an equivocal stance, advising its supporters, on 8 April, to "vote as you see fit". ^ "Official Monster Raving Loony Party : Membership". Loonyparty.com. Retrieved 12 September 2014. ^ "Screaming Lord Sutch – History & Timeline". The Loony Archive. Archived from the original on 26 August 2009. Retrieved 31 August 2014. ^ "Statement of persons nominated and notice of poll". Cambridge University Raving Looney Society. Retrieved 31 August 2014. ^ "Is This The Worst Election Candidate Ever?". Retrieved 12 June 2017. ^ Hemming, Henry (2 April 2009). "In Search of the English Eccentric". Hodder & Stoughton. Retrieved 13 February 2019 – via Google Books. ^ "BBC News | UK | Suicide verdict on Sutch". news.bbc.co.uk. Retrieved 25 March 2018. ^ "Loony's Past R I P". Loonyparty.com. 14 October 2013. Retrieved 12 June 2017. ^ Sharpe, Graham (2005). The Man Who Was Screaming Lord Sutch. Aurum Press. ISBN 1-85410-983-9. ^ a b "2005 GENERAL ELECTION MANIFESTO". Loonyparty.com. 18 May 2011. Retrieved 12 June 2017. ^ "Squatters take over York pub". York Press. York. 30 May 2003. Retrieved 30 March 2019. ^ "Latest news". Sawleyparishcouncil.co.uk. Archived from the original on 14 July 2014. Retrieved 31 August 2014. ^ Wells, Anthony. "Sedgefield". UK Polling Report. Retrieved 3 January 2013. ^ Wells, Anthony. "Ealing Southall". UK Polling Report. Retrieved 3 January 2013. ^ "Monster Raving Loony Party is 'ahead of our time' says leader". BBC News. Retrieved 12 June 2017. ^ "Councillor details – Councillor Stuart Hughes". 12 June 2017. Retrieved 12 June 2017. ^ a b Chakelian, Anoosh. "What are the Monster Raving Loony Party's election plans?". Newstatesman. Retrieved 8 January 2018. ^ "Elections | The Official Monster Raving Loony Party". Loonyparty.com. Retrieved 27 May 2015. ^ "Fleet Town Council – Councillor Contact Details". Fleet-tc.gov.uk. Retrieved 11 June 2015. ^ "Packed house for Election Hustings at the Jubilee Centre". Eastgrinsteadonlnie.com. 16 April 2015. Retrieved 25 June 2016. ^ "Limpsfield Parish Council – Parish Council Members". Surreycommunity.info. Retrieved 25 June 2016. ^ "East Lindsey District Council". Democracy.e-lindsey.gov.uk. 22 July 2009. Retrieved 25 June 2016. ^ "Castle's the loony launch pad". Mewarkadvertiser.co.uk. 4 June 2014. Archived from the original on 11 June 2016. Retrieved 25 June 2016. ^ "Roger Monksummers". Gillinghamdorset-tc.gov.uk. Archived from the original on 11 June 2016. Retrieved 25 June 2016. 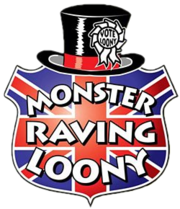 ^ "The Official Monster Raving Loony Party; Vote For Insanity". Loonyparty.com. 3 July 2014. Retrieved 12 July 2014. ^ "Obituary: Patrick Moore". BBC News UK. 9 December 2012. Retrieved 31 August 2014. ^ Edwards, Brian (6 May 2015). "7 Monster Raving Loony Party policies which are now part of UK law". Mirror. Retrieved 30 March 2019. ^ "AV? | The Official Monster Raving Loony Party". Loonyparty.com. Retrieved 12 July 2014. Jon Ronson (15 January 2000). "Beyond a joke". The Guardian. "Farewell to the Loony Lord". The Argus. 15 October 1999. Archived from the original on 29 September 2007. "Sawley Parish Council minutes of meetings, 26/4/2005 until present". Archived from the original on 8 September 2008. Retrieved 1 July 2008.